We've previously made note that Cobra Commander is getting a full-on costume change for G.I. Joe: Retaliation, with the character now looking a lot more like his animated series counterpart, but he's not the only one. 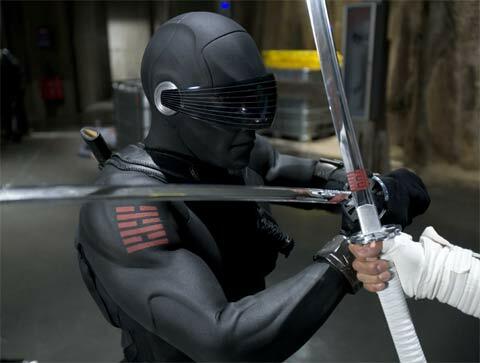 While Snake Eyes was one of the better parts of Stephen Sommers' 2009 film, many complained about the weird lips that were built into the mask. That too has been changed in the sequel. 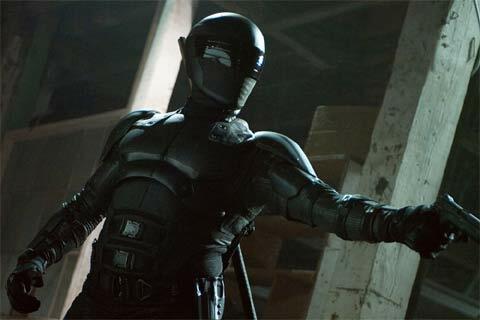 Total Film has gotten their hands on an exclusive new image of Snake Eyes from G.I. Joe: Retaliation and while it's still the same actor underneath - Ray Park - he has undergone some big changes. In addition to the aforementioned "lips," it looks like the character has also gotten an armor upgrade (much like Christopher Nolan's Batman, I assume that the multiple plates will allow him to move better) and the visor actually looks like it's part of the mask now as opposed to being an attachment like it was in Rise of Cobra. Check out the new image below (click on it to head over to the source and see it full size) as well as a comparison image from the first film. Directed by Jon Chu, G.I. Joe: Retaliation stars Dwayne Johnson, Adrianne Palicki, Ray Stevenson, Joseph Mazzello, Ray Park, Arnold Vosloo, Byung-hun Lee, Walton Goggins, Channing Tatum, RZA, Elodie Yung and Jonathan Pryce. The film will arrive in theaters on June 29th and to see more from the title you can head on over to our Blend Film Database.